A business answering service is a way of outsourcing call handling to skilled and trained professionals. Much like you might hire a virtual assistant to manage your inbox, or a virtual social media manager to take care of your profiles, taking on a business answering service is another smart way of delegating your comms so that you’re free to focus on driving your business forward. As a virtual assistant, call answering is a service having teamed up with a local company. I have key insights into the process and I want to help you gain a better understanding of exactly what it involves. 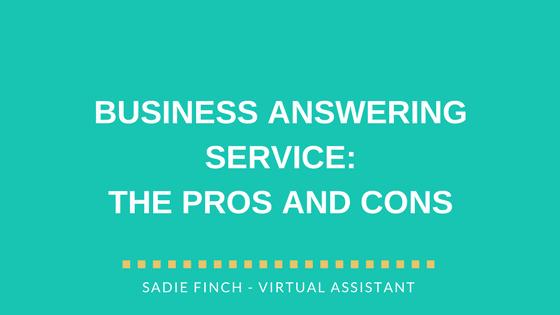 In this post, I’ll identify the key pros and cons of using a business answering service. Hopefully, reading this short overview will help you make a decision that’s right for you. First, let’s take a look at who might use a call answering service and why. Who might use a business answering service? You’ll find a business answering service to be much cheaper than the cost of hiring a receptionist or customer service representative. In most cases, you’ll pay a small monthly fee for the service and then only pay for the number of calls handled. (Find out exactly how much I charge for this service by visiting my call answering page). If you’re a product-based business that takes orders over the phone, a business answering service could work well for you. Order taking is generally a simple process that a call handler can pick up with just a little training. Similarly, if you’re a service-based business that has a lot of meetings, how much time does appointment management take you (or the members of your team) each month? Could that time be better spent elsewhere? Maybe you work from home and are struggling with work-life balance. Some entrepreneurs choose to divert their calls to a business answering service outside of their normal working hours. This means they’re able to enjoy personal time with family whilst still providing a consistent level of service. Other entrepreneurs working from home may choose to use a call answering service because it gives them a more professional edge. If you’re a busy entrepreneur who’s always in and out of meetings, you might find you have more missed calls than you know what to do with. Of course, there’s always voicemail, but would your callers prefer to speak to a human who can answer their basic questions, book them an appointment, or take their order right away? It’s rare these days that we can easily get in touch with a business by phone. We expect long queues, callbacks, answering machines and automated systems. When our calls are answered quickly by a friendly professional – and on the first time we’ve called – we’re left with a feeling of satisfaction and accomplishment. It means we’re able to tick that job off the list and move on to the next thing right away. It’s good customer service and your callers will thank you for it. Whilst hiring a receptionist or a customer service assistant can also help to improve your customer service levels, there’s no doubt that a call answering service is a much cheaper option. It’s also a lot easier, as it cuts out the need for any recruitment related admin and employee management. To find out more about prices, visit my call answering service page. How often does your phone ring and go unanswered? Do you miss a lot of calls? What if the caller doesn’t leave a voicemail and their number is withheld? Without a business answering service, you could be missing out on sales and/or valuable opportunities. Also, depending on your industry, some callers may need to reach you outside of normal working hours. If you have no one picking up your calls in the evenings or on weekends, you risk losing out. It’s important to consider clients who are in different time zones, too. Are you making it easy for them to buy your products or use your services? A hired call handler won’t know the ins and outs of your business, but you do. So if you’re spending less time on the tasks that can be easily outsourced – like call answering – you’ll have more free time to focus on the in-depth stuff that requires your attention. One of the downsides to outsourcing call handling is that you (or your employees) won’t be the first point of contact. Whilst call handlers from any reputable business answering service provider will be professional, polite and well-trained, they won’t know your business inside out, like you do. What they will know, though, is how to deliver an expert level of customer service. So even if they don’t have the answers right away, they’ll know how to reassure your clients. We’ve all had one of those difficult phone calls with someone in a call centre in another country. As hard as we might try to understand each other, sometimes a language barrier can make things far more difficult than they need be. If it’s important to you that your calls are answered locally, check out my call answering service. I work with a dedicated local (UK based) team to provide a first-class service. Like any business decision, it’s important that you take the time to weigh up your options. Think carefully about whether a call answering service is the right solution for you. I hope this article has given you a good understanding of how this service might work for your business. Should you have any questions or need more information, please call me on 07468 567419 or email me at sadie@sadiefinch.com.